Want to sleep like a baby? You have found the right hotel with its new Sweet Bed bedding... and at a great price! See you soon! 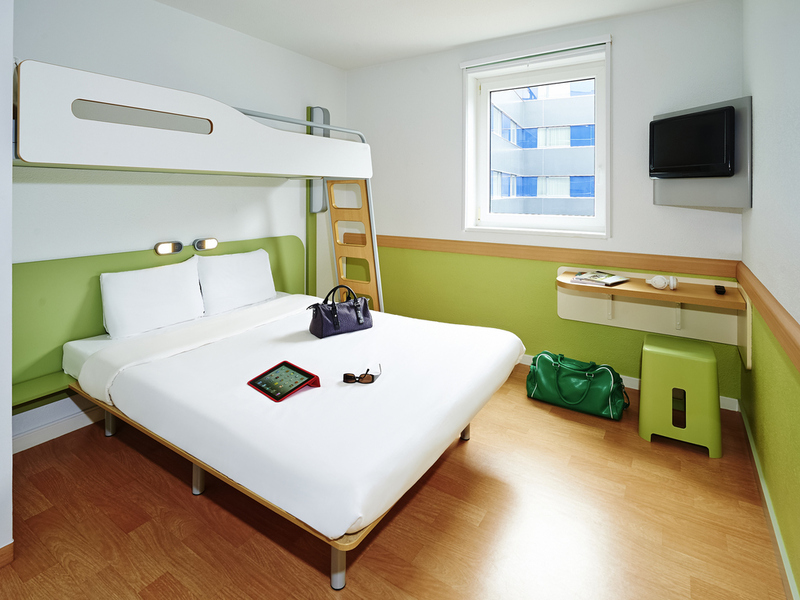 The ibis budget Paris Porte de Bagnolet hotel to the east of Paris offers spacious rooms, including triples, all featuring a private bathroom, air cooling system and free WIFI. A catering service is available on the ground floor of the ibis Bagnolet hotel. An unlimited continental buffet breakfast is served from 6:30am. Ideal for your business and leisure trips, its privileged location 547 yards (500 m) from the international bus station and 2 minutes from public transport (metro line 3 - Gallieni stop) makes traveling easy, with direct access to central Paris (République in 12 minutes, Opéra in 20 minutes). A covered private car park with 120 spaces is available on Rue Adélaïde Lahaye, 93170 (charges apply). Basic, clean-ish, great location, friendly staff. Our stay was OK, entrance via the stairs adjacent to the premium ibis hotel was very very dirty so went around the long way to enter and leave. Room was small and basic which was perfect for us however it could have been a little cleaner. Great location, shopping centre with huge supermarket was very close by with buses and trains to every part of Paris. Staff were friendly and helpful. The room was comfortable although the tv picture quality was poor. There was not even a chair in the room to sit down to watch tv. There were some dirty spots on the floor which were never clean properly by the cleaners. The staff was really helpful. Thumbs up. I understand that this is a value priced hotel, but I never imagined that this could mean that our room would be disgusting to stay in. Dust accumulation on the bunk-bed rail, stained bathroom floor and toilet seat, dirty looking walls and ceiling, window blinds that don't work, no hair dryer, etc. We mentioned our concern to the front desk clerk, who kindly offered us a different room, but it was just as bad. Couldn't wait to get out of the room, the building and will never stay at an Ibis again. On the positive side, the beds were reasonably comfortable and the staff were very kind and as helpful as can be given the establishment they are working in. Monsieur C., Nous vous remercions pour vos commentaires suite à votre séjour à l'hôtel Ibis budget Paris Porte de Bagnolet. C’est avec grand plaisir que nous recevons vos compliments. Aussi, nous ne manquerons pas de partager vos appréciations avec toute notre équipe. Votre satisfaction est la plus belle récompense pour notre personnel qui travaille jour après jour pour vous offrir un service irréprochable. Nous prenons également en compte le fait que notre établissement a besoin de rénovation. Dans ce sens, nous travaillons actuellement sur des projets de rénovations afin d'améliorer la qualité de notre produit. Dans l’attente de vous accueillir de nouveau, nous vous prions de croire, Monsieur, en l’expression de nos sentiments les meilleurs. The television channels were ALL in french with no English channels for me to watch. I was also NOT given or offered a travel cot for my 8 month old son although his name and age was on the booking request. On booking, there is no option to select a travel cot. My son had to spend the night sleeping in his pram. The breakfast in the morning was nlt value for money as only a very tiny selection of continental breakfast was on offer. I have the sickening feeling that my small eye glass box that I use for my jewelry was lost or stolen at this place when I was at this hotel last fall. Could be when I ate breakfast and did not put the sign DO NOT DISTURB on my door. Only found out when back home 2 days later. Room was OK but why was was there a small unexplained charge on my credit card? I received a facture which shows the charge of 39 cents on my credit card but there is no explanation of what this is for. I paid for my sejour in full so I do not understand why there is this small charge and why it is not clearly explained to me. Less services than I payed for. Normal Ibis is more according to what you pay for. Have to change eoom twice. First there was a broken window. Second not with the bed we booked. Floor was dirty. No dishes in breakfast. Elevators not working constantly. Reception lack of experience and do not help. The room was dirty and cleaned once in 4 days. I overall enjoyed my stay. Hotel well located,staff are friendly, rooms are generally clean however the TV was not properly fixed and the brackets were very loose and the breakfast needs more refreshing. Could have had a hairdryer and shampoo. Very good hotel. The breakfast is perfect, nice bread. Croissant, nice room, so close to Carrefour and other shops. Very safety, near to airport Orly. The sower is perfect, everethine insede is very clean and new. Locatios was good, close to metro station and shopping centre. Room size was ok, rooms were a bit old and bath had some mould.